Stocks in London are set to open sharply lower on Wednesday following a slump on Wall Street overnight that was tracked by Asian markets, with the optimism seen at the start of the week fading. To come in the economic calendar on today are services PMIs from France, Germany, the eurozone and the UK which might impact trading activity. However, markets in the US will be closed in honour of former US President George Bush and this might likely lower volume. In political news Theresa May is still battling to keep her Brexit agenda on track as MPs are again set to clash prior to parliamentary vote on December 11. Trading higher at the open, the UK stock index was unable to hold its gains as the bears took control ending the day below its opening price. The selling drags on this morning as well as the index is seen opening below the 7000 support line and slightly over the next key technical support at 6955. Additionally, prices are now trading back below the 20-day moving average which is seen as a bearish indicator. 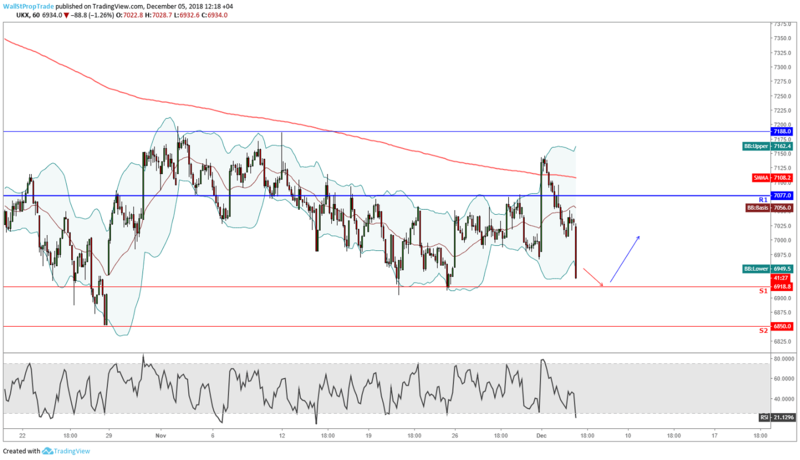 The RSI on the 1H chart is also bearish signaling some more selling ahead, however it looks like it will drop below the 20 line soon indicating extreme oversold conditions, and this might trigger a bounce off the Footsie's technical support line at 6920.